"Women account for 51 per cent of Australia's population and are a critical talent pool within the areas of science, technology, engineering and mathematics," Mr Chester said. "The Australian Defence Force (ADF) is working to attract and retain more women to set up Defence and our nation for the future. "The servicewomen featured in these videos hope to inspire girls in science, mathematics and technology classrooms across the nation to stay engaged and reach their potential." 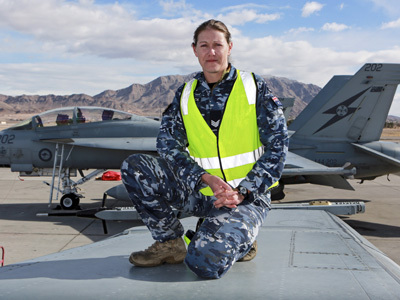 Women in the ADF are operating and maintaining advanced technology on Australia's submarines, operating remote-controlled drones to keep our troops on the ground safe and flying and maintaining the fastest and most manoeuvrable aircraft in Australian skies. With Australia's advanced submarines entering service from the early 2030s, girls currently studying STEM subjects at high school could become the future commanding officers of these vessels," Mr Chester said. Defence is also one of Australia's most prolific and experienced users of drones. Multi-skilled team players with excellent problem solving skills will be needed to fly the latest generation of uninhabited surveillance aircrafts and be the eyes and ears of the battlefield. "Talented women are also part of the team of technicians keeping the first two F35-A Joint Strike Fighter aircraft in our skies," Mr Chester said. "These are just some of the exciting and challenging career opportunities the ADF has to offer to technologically minded individuals." Imagery can be viewed at on the Defence image gallery.